Count on Original HP Toner cartridges with JetIntelligence for professional quality, more pages with affordable high-yield options, excellent performance at high speeds, and innovative anti-fraud technology—something the competition can’t match. 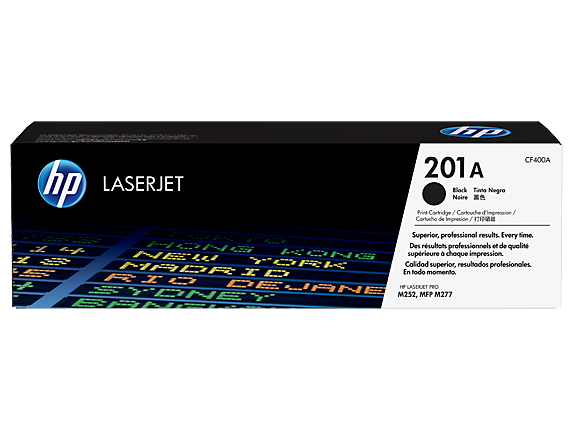 HP 201A Black Original LaserJet Toner Cartridge. Print for longer than ever before—get up to 28% more pages per optional high-yield black cartridge. Print more pages, using optional Original HP High Yield Toner cartridges with JetIntelligence. Count on consistent quality and help manage costs—with anti-fraud technology. Produce top-quality documents, at speeds your printer was built to achieve. Original HP Toner with JetIntelligence is specially engineered to match your printer or MFP’s high-speed performance, while producing professional-quality prints. Get high-quality prints from your printer or MFP. Original HP Toner cartridges with JetIntelligence match your printer’s high-speed performance and increase efficiency. Go with toner that works best with your printer—Original HP.